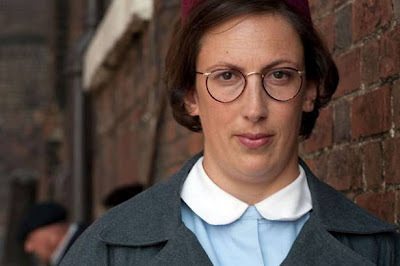 Nothing made me laugh more than seeing Miranda Hart playing a midwife called Camilla Fortescue-Cholmeley-Browne (known as "Chummy") skidding round the corner on her bicycle (just as I probably would), riding straight into a policeman, and on her way to a delivery (which turned out to be triplets) dropped the delivery pack, which meant that by the time the third baby appeared, she had to strip from her nurses uniform and wrap the baby in her dress.. It was the first time that I had seen her act as well as be in her usual comedian role. I think its hard to be good at both, but she was brilliant. Excellent programme, I was also hooked, knowing it was a true story. Miranda says she thinks of herself as Drama comedian, rather than a stand up.Hope they do a next one. Did anyone watch the first episode of Upstairs..Downstairs? I am old enough to rememeber the first series, this I thought was better. Loved the series. 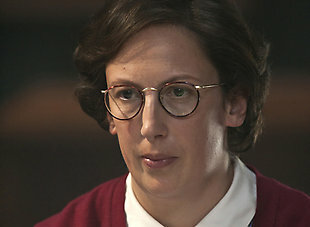 Having read the book, I though Miranda was absolutely perfect for the role and she played it brilliantly.